Surprise, surprise. 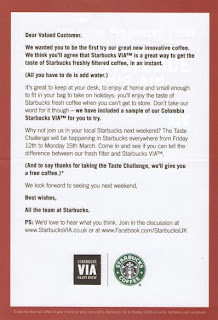 As soon as I wrote the blog article about supporting offline activities with online tools and vice versa, I receive this through the post from Starbucks. And what a great example it is. Starbucks have an event this weekend, the Starbucks VIA Taste Challenge,to celebrate the launch of their instant coffee all over the UK and they're inviting people into their local Starbucks. I received this letter, along with some free Starbucks VIA through the post yesterday (perfectly timed 4 days before the event). As you can hopefully see, the P.S at the bottom is encouraging people to visit both their website and their facebook pages for more information. This encourages those who already know about their online presence to join in the conversation and creates awareness for those that don’t. Naturally I took a look (http://www.facebook.com/event.php?eid=340304474474) and as you'll see, there's a great community already discussing the event, where they'll be going to take part as well as various other details. And, thanks to facebook’s events page, Starbucks know that over 30,000 of their 306,000 fans will be attending across the weekend. Along with their use of the pre pay Starbucks card, Starbucks continues to enjoy a great dialogue with its customers and specifically target their marketing accordingly.